Meet Helio Gaming at ICE 2019. Find us at stand N7-433 to have a chat about how we can help to improve your offering. We will be on hand at ICE next month to showcase our comprehensive range of lottery products – to both existing operators and those who could benefit from joining the sector. The industry’s flagship conference is at London’s ExCeL exhibition centre between 5-7 February. We will be at stand N7-433 to demonstrate just how effective our games can be. They help you to acquire, retain, and even reactivate customers. 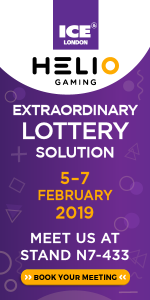 Helio Gaming at ICE 2019 – our team will be showing delegates our Hero range of products. Including Lotto Hero, The Daily Hero, Hero Millions, and The Big Hero. These will be joined by the ever-popular betting on international lotteries. These include (not just) the U.S. Powerball, EuroMillions, MegaMillions EuroJackpot, and German 6/49 draws. Excitingly, we’ll also be giving visitors a sneak preview of our live lotteries from our Malta offices. We’re expecting them to have the same player engagement and excitement as live dealer has in casino. If you’d like to find out more about these products, please visit our stand. Book a meeting or drop one of our staff a message on LinkedIn. For more information on Helio Gaming or to speak with our CEO, Richard Mifsud, please contact Robin Hutchison at Square in the Air on robin@squareintheair.com. © 2019 Helio. All rights reserved.